A long time fan of the bar Brooklyn Social, I was super excited when I heard the same owners were opening a new spot on Henry Street near Atlantic Avenue. Henry Public opened in 2009 just a few blocks west of my old apartment and became a local favorite fast. From the exterior, the bar looks like a Whitman-era saloon. The same style is carried inside where the focal point is a beautiful old wood bar. The cocktails are old school as well and include lots of rum and bourbon mixed into smashes and sours. My favorites are the Oddfellow (rum, lime, grapefruit, maraschino, house bark, and root syrup) and the Public Smash (bourbon, mint, maple syrup, and aromatic bitters), the later of which has helped me on a quest to learn to appreciate bourbon. If you’re staying for dinner, the turkey leg sandwich is a must. It’s moist, it’s delicious, and it comes with really good fries – just ask PA Kiki who devoured it with me a few months back. In 2010, this very special sandwich was named New York’s Best Turkey Sandwich by New York Magazine. They also serve burgers, mac n’ cheese, and grilled cheese with sliced apples. Power Animals field trip? 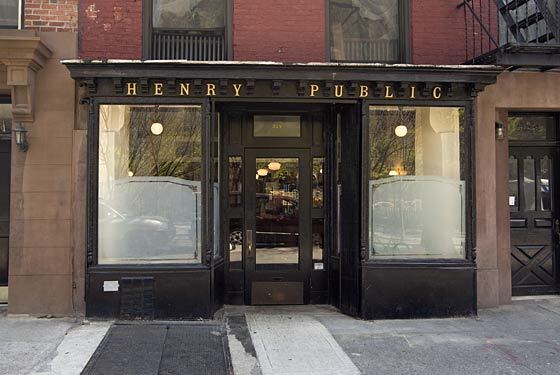 Visit Henry Public at 329 Henry Street near Atlantic Avenue in Brooklyn. « Finally: The Ultimate Cleanser	» Let it Snow! I was there recently for a friend’s birthday brunch and LOVED it! I had the shrimp & grits, and it was absolutely delicious. I’m more than happy to take field trip. Would it be a good spot for a PA brunch, or should we go there another time? I like the sounds of this turkey sammie! When I went we were a big group, and we lingered, so maybe it’s a good spot! It could be a good PA brunch if we got there on the earlier side…we’ll also have to take an evening field trip so we can have cocktails…though perhaps if brunch is after noon we can have cocktails then? Just saying.